When I was in school, we had some “boring” subjects like, History, Geography, Social Science etc. These were “arts” subjects and were considered low scoring as well. When I think about it now, I realise that History text book basically used to be like a collections of a few chapters and each chapter was like a story of a particular era. For instance, first chapter was Ramayana. second Chapter was Mahabharata. Third chapter was Mauryavansh (Chandragupta Maurya , Samrat Ashok etc. A few chapters later, we were into Mughal era (Akbar, Shahjahaan etc, and then British Era. In British era, we had discussion on freedom struggle. In freedom struggle, we basically read that non violent movement by Mahatma Gandhi earned India their freedom. There was passing mention of Bhagat Singh, Chandrashekhar Azad, Subhash Chandra Bose etc as well. Then we were told that British were defeated by the non violent movement of Gandhi and they gave India independence, but at the last moment, they played a dirty trick and divided the country into two. Many decades on, when we can gain information from sources other than test books published by the government or gooverment approved publishers, we can have a more holistic picture of things as they unfolded. We now have access to other sources as well as so we can form our own opinion on what was happening those days. It could be seen that the country, like now, had people with different ideologies and people followed their own ideologies. There were followers of Mahatma Gandhi, but then there were followers of other leaders as well. We have seen that Subhash Chandra Bose had a tremendous following. And his philosophy of gaining independence for India was different from that of Mahatma Gandhi. Since history is written by “victors” and somehow Mahatma Gandhi’s non violent movie has been credited as the reason for India gaining independence so Indian freedom struggle has been penned accordingly. When one thinks about it dispassionately, one realises that British were no saints who would somehow be shamed by “non violent” movements and would grant independence to India out of shame. There were many factors that made it increasingly difficult for them to continue to rule India. It was a combination of all these factors that finally broke the back of camel and Britain finally granted independence to India and left at the earliest opportunity. The major cause why Britain left was that two world wars had taken place and it had taken a heavy toll on Britain financially. Britain was the sole superpower of the world before the first world war. After the end of the second wold war Britain was economically on the verge of collapse. They had to take loan from USA the new superpower of the world to keep their economy afloat. India had contributed a good number of armymen to fight the world wars for Britain. It was the understanding that Britain would grant Indian independence after the world war. Moreover, with Media (radio, newspapers etc) becoming influential, world opinion was turning in favour of freedom of India and it was becoming difficult for Britain to hang on to its colonies. When we look at history, we find India was becoming ungovernable from early 1900s, because there were many cases of armed resistance from all over the country. Not all freedom fighters were moderates. There were radicals as well. In fact , there was a trio of radicals popularly called Lal, Bal, Pal- viz Lala Lajpat Rai, Bal Gangadhar Tilak, and Bipin Chandra Pal. They incidentally, belonged to three major regions of the country and helped spread their message of armed struggle in their regions. Taken together, that was almost entire India. They advocated civil agitation and direct revolution to overthrow the British Empire. British Government divided Bangal province and that caused widespread resentment among people. The protest against it was violent and quite a few protests died, some in police custody (viz Brahmabhandav Upadhyay) while some were hanged (Khudiram Bose, Bagha Jatin). Then Draconian Rowlatt act was passed in 1919. Protest against this act led to the Jallianwala Massacre on 13 april 1919. The main perpetrator Dyer was forced to retire but he was hailed as a hero in Britain. Whatever goodwill Indians had for British government evaporated totally. During 1920s, several armed resistances happened all over the country. One of the more prominent of them was Kakori Case (1925) in UP. Government treasury was looted while it was being carried in a train. In this case, three revolutionaries, namely Ramprasad Bismil, Rajendra Lahiri, Raushan Singh and Ashfaqullh. It is noticeable that such activities were happening all over India, and in all these cases some people were prompmtly being found guilty and were being sentenced to death, no less. So many people were sentenced to death those days that the claim of Indian freedom fight being mostly non violent does not sound too convincing. 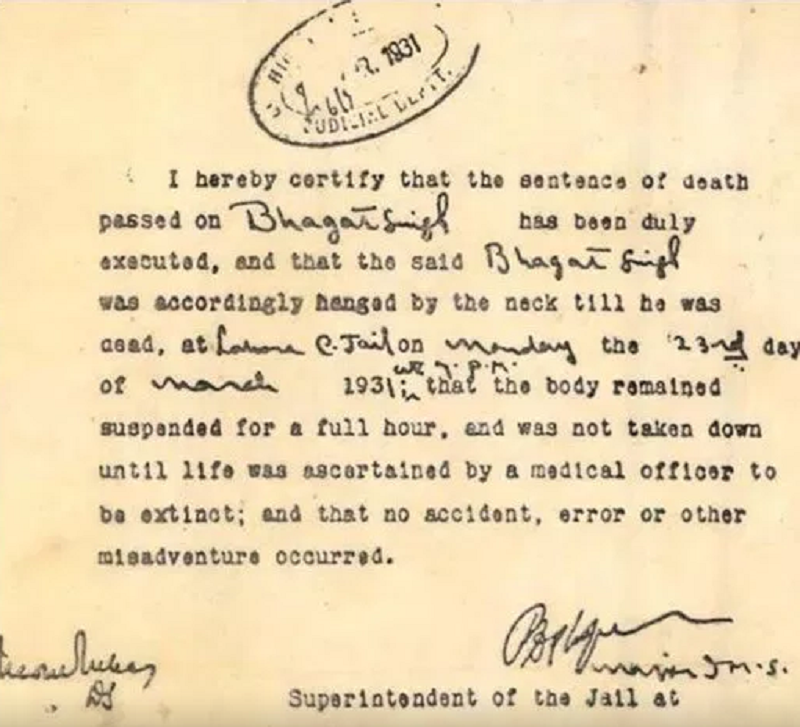 On March 23, 1931, Bhagat Singh along with his associates Sukhdev Thapar and Shivaram Rajguru were hanged to death for the killing 21-year-old British police officer John Saunders. They mistook Saunders for Superintendent James Scott, who was responsible for leading a lathi charge against Lala Lajpat Rai, who along with his followers was protesting against the Simon Commission. Lala Lajpatrai was mortally injured in a Lathi charge on him by police led by Superintendent James Scott, when Lala Lajpatrai was leading a protest march against Simon Commision. Death of Lala Lajpat Rai stung Indians. Bhagat Singh, Bhagat Singh along with his associates Sukhdev Thapar and Shivaram Rajguru decided to avenge it by killing James Scott, but instead they killed 21-year-old British police officer John Saunders. 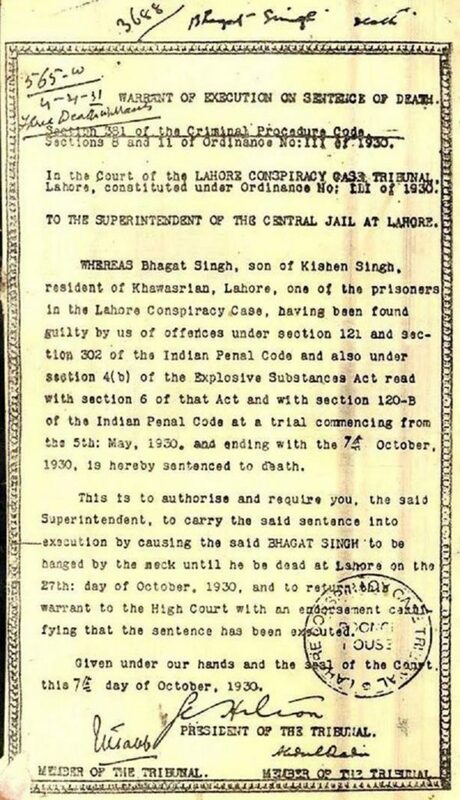 The case was heard on the court of Lahore Case Tribunal from 5th may 1930 and death penalty was pronounced on 27 october 1930. 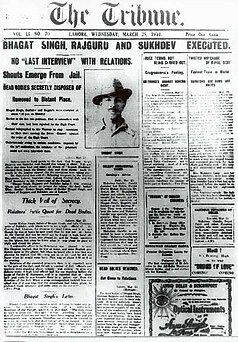 Bhagat Singh along with Sukhdev Thapar and Shivaram Rajguru were hanged to death this day 88 years ago (23 march 1931). Several movies have been made on Bhagat Singh. In all these movies, the song “Mera rang de basanti chola” gets played prominently. In these movies the three revolutionaries are seen marching to the gallows while singing this song (or while this song plays in the backgound). Here is this song from “The Legend of Bhagat Singh”(2002). This song is sung by Sonu Nigam and Manmohan Waris. Sameer is credited as the lyricist, though this lyrics could well be a traditional song. Music is composed by A R Rahman. 2 Responses to "Mera rang de basanti chola"
Salute to the heroes who enabled us this freedom. And then there is this generation that doesn’t know the struggles of that generation went through. I was just speaking to my mother in law, and I found that there was no knowledge of the happenings of the northern part of the country. Atul Ji, nice post on “History’. . History certainly has many versions depending on the writer/ historian ( self proclaimed) . The movie of this post is the best of some 5(?) films on Bhagat Singh released around same time. Manoj Kumar’s one ( released much earlier) is also well remembered.